and succumbed to the night. A twiglet is a word or short phrase meant to motivate. beams flicker upon their bed. Written for dVerse, the virtual pub for poets. Today Victoria is our host, asking us to use the word “burn” or a form of the word, in a quadrille (poem of exactly 44 words, sans title). For a second and more humorous take on the word, go to my second post, Summer Treat. Sweet darling, accompany me I pray. Our hearts and souls aligned, yet still we spar. I promise to lead thee nowhere astray. whither we goest? And the door’s left ajar. I shall protect thee as a fragile star. beguiles my mind, my loins, I lust too far. struggles to recall who and what we are. I promise to lead thee, nowhere astray. ’tis painful unrequited love to bar. Pub opens at 3 PM. Stop by and see what others have done with this unique form! Written for dVerse, the virtual pub for poets. Today we’re asked to write a Lai: an old form of telling tales – a 9 line poem with an aabaabaab rhyme scheme where the a lines have 5 syllables and the b lines have 2 syllables. I give you a springtime tale of love! Pub opens at 3 PM Boston time. Come on over and imbibe some words! over a cup of tea and slice of sole. lemon balmed her into paroxysms of love. Twiglet #10: scent of lemon. Misky posts a twiglet every Tuesday: a short phrase, a word, to prompt a thought, a flow or a memory. 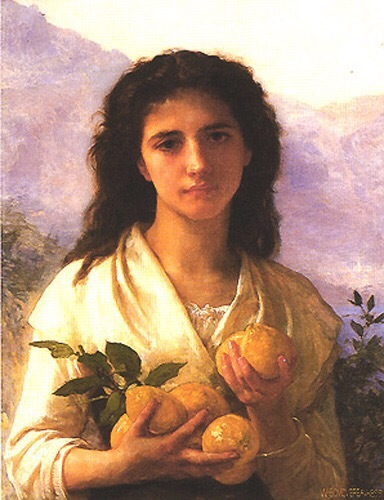 Artist credit: Girl Holding Lemons by William-Adolph Bouguereau, 1899 -found in wiki art. your fingertips across my skin. I’m hosting Poetics at dVerse today – that wonderful virtual pub for poets. I’m asking folks to write a poem that includes a unique verbification – a noun or adjective used as a verb. Think Google — originally a proper noun, the name of a company. People started to say “google that” and through repetition, it became a verb. How about “ganache me” — wouldn’t that be delectable? My post, One Night, verbifies nova – a star that suddenly flares and then fades slowly. Come join us at dVerse to read and enjoy; and maybe, also, to post your own verbification! Pub opens at 3 PM Boston time. Photo: in public domain. Toni hosts the bar at dVerse today (bar opens at 3 PM) and asks us to write a Tanka, a Japanese form of poetry comprised of five lines with the following syllabic count: 5-7-5-7-7. This form is older than the haiku, first appearing in the 8th century! There is no punctuation, no capitalization, and no title. Third line is a cutting or pivot line. The first two lines examine an image and the final two lines are a personal response. Tankas were considered a “female” form, written more by females than males and were often sensuous. Photos from Bermuda. exactly 140 characters. A character is defined as a letter, space, hyphen, or punctuation mark.